Full coverage of President Trump's visit to Minnesota. Rep. Jason Lewis at Rochester rally: "Minnesota loves our farmers now thanks to the president — we have free trade and fair trade." MINNEAPOLIS (AP) — President Donald Trump says anger over resistance to his Supreme Court nominee Brett Kavanaugh's confirmation will drive Republican turnout this fall. 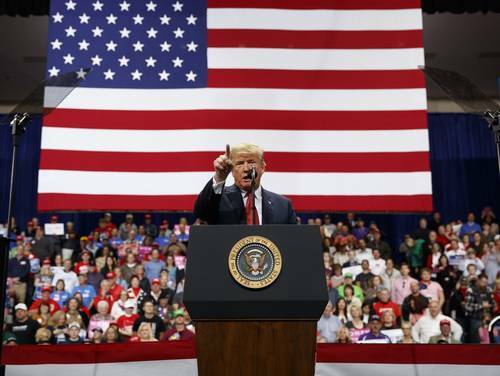 Trump tells a rally crowd of thousands Thursday evening in Rochester, Minnesota, that Democrats' "rage-fueled resistance is starting to backfire at a level nobody has ever seen before." "We love it," Trump tells the crowd. Trump is also talking up Kavanaugh's credentials as a handful of undecided senators in Washington mull his nominee's fate following sexual misconduct allegations. Trump says Kavanaugh is an "incredible" intellect, judge and talent and will defend the constitution as written. He's also criticizing Democrats, saying they "have been trying to destroy Judge Brett Kavanaugh since the very first second he was announced." We've moved on to foreign policy, including @realDonaldTrump 's meeting with N. Korea. 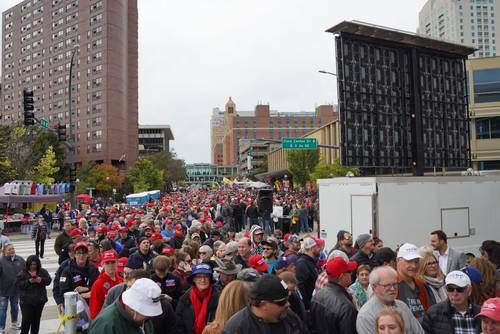 "I have a very good relationship with Chairman Kim" Says him not being tough enough on Putin is "fake news"
Thousands of people poured into Rochester to hear President Trump's speech on Thursday, Oct. 4 as others protested outside. MINNEAPOLIS (AP) — President Donald is calling former Minnesota Sen. Al Franken a "wacky guy" who folded "like a wet rag." Trump is telling a crowd of thousands at a rally in the state that Democratic Sen. Tina Smith, who is running to fill the final two years of Franken's term, "took a wacky guy's place." He's also mocking her low name recognition, saying, "Nobody knows who the hell she is." Franked vacated his seat in January in response to a string of sexual misconduct allegations and amid tremendous pressure from Democrats. Trump is marveling how quickly he resigned, saying "boy, did he fold up like a wet rag." Smith's challenger, state Sen. Karin Housley, jokingly chastised Trump for mentioning her opponent's name so often. "You really do go off script, don't you?" she said. Outside of President Trump's rallies, you will find vendors. Some selling items that mock the president, others that promote him. MPR News photographer Evan Frost talked with one man who makes money supporting Trump — Richard Freeman of Kansas. I work for Local 31 in Kansas City, I'm a stage hand and I'm a vendor at the Trump rallies. So when did you get on the road doing this? I started about a year ago. And Trump started more rallies based on the need to protect votes and/or win more votes in the upcoming midterms. And so as they began their push, we began our push. Do you have a main platform that you support? Not in particular, not in particular. I was born and raised a Republican, and I support my party. So you're a supporter of Donald Trump, but you also turned your support into a business. Can you tell me about that? Well, being a Trump supporter, it's kind of a double edged sword because I can also get the word out for the party as well as make a living at it too. So, this is income in my family's pocket, paying for tuition for two out of state students, and that's positive-positive in my book. And how many rallies have you been to since you hit the road? At least 15, yeah, in different parts of the country. All over the country from Billings, Montana, all the way to Tennessee. In a matter of months. What's the best part of it for you? Meeting the people. You know, seeing the different faces, getting the different views of people. Having the opportunity to explain my views to people, with whom I have different views. And keeping it civil. I struggle to see why so many people are so aggressive in trying to get their messages out. But for me, you catch more bees with honey than you do with vinegar, so. President Donald Trump is taking credit for pushing Canada to allow Canadian ads to be shown during Super Bowl broadcasts as part of the negotiations over the revamped trade agreement among the U.S., Canada and Mexico. Trump tells a rally crowd in Minnesota that he'd heard the NFL had a "big, big problem" and stepped in. He says, "it took me two minutes and now the NFL is so happy." Trump also says he got a call from NFL Commissioner Roger Goodell thanking him for his efforts. The president made a lot of claims during his campaign rally Thursday night. Some were more accurate than others. 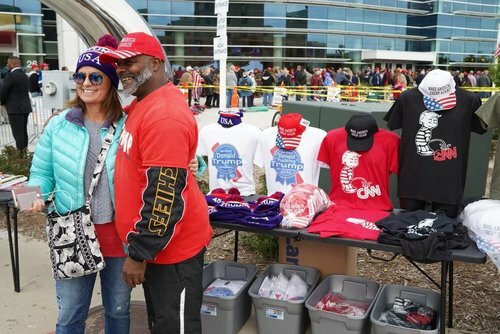 Outside of President Trump's rallies, you will find plenty of vendors, some selling items that mock the president and others that promote him. MPR News photographer Evan Frost talked with one man who makes money supporting Trump. President Trump continues to insist that Republicans can win in states like Minnesota that voted for Hillary Clinton in 2016. 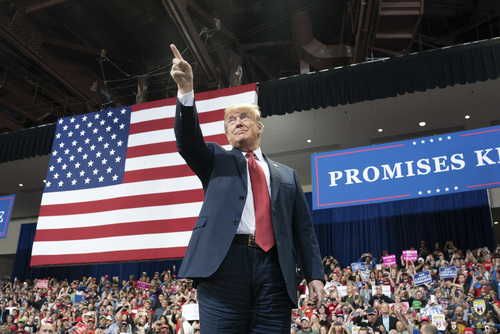 In a speech to a full house at the Mayo Civic Center Thursday night, Trump also pledged to take Minnesota in 2020. Catharine Richert has more.